Who doesn’t love a game of darts? There’s nothing more fun than a friendly competitive game of darts with some friends. Unfortunately, this usually requires a trip to a seedy bar where the board is either in poor condition or surrounded by a few drunken patrons clamoring for their turn. To skip that headache, guys can get a dartboard of their own. Whether you are a serious competitor or just a casual player, a dartboard is a great thing to have in your man cave. 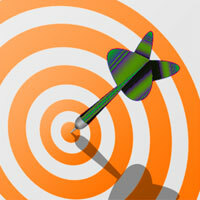 While most guys don’t realize it, there are a ton of options when it comes to dart boards. Not only are there different makes and models, but there are also different styles. 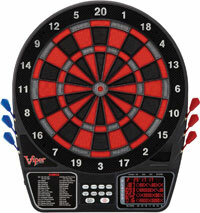 Depending on your taste, you can opt to go with a modern electronic dartboard or a traditional bristle board. Each of them has their benefits. Bristle dartboards hark back to a time of casual playing in a pub. 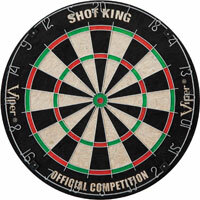 Usually used for tournaments, these boards are best suited for those serious about darts. Contrary to their name, bristle boards are actually made of sisal or hemp. The sisal fixes itself after a dark hits it, making it a great material for dartboards. 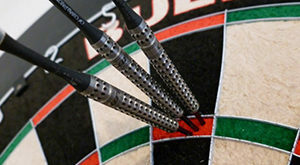 The darts used with bristle boards have a steel tip and a body made from brass or tungsten. They aren’t toys by any means. While they may be a bit more dangerous, these darts provide an authentic playing experience.. 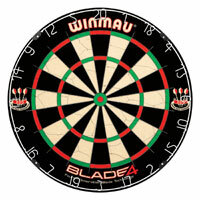 If you want a high quality bristle dartboard, the Winmau Blade 4 is the way to go. It is made of high-quality sisal that is woven incredibly tight. This helps the sisal heal better and ultimately prolongs the life of the board. It also features some of the thinnest triangular-shaped wire available. This creates a larger scoring area while preventing bounce outs. The triangular shape guides the dart into the board rather than across the room. It is also free of staples, eliminating the worry of causing damage if they are hit. With a removable score ring allowing you to rotate the board for even wear, this board is sure to last many fun nights. 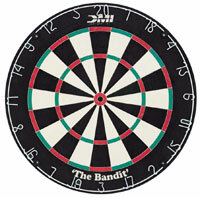 The DMI Bandit Staple-free Bristle Dartboard is officially sanctioned by World Darts Federation. In fact, it’s been the official board for the World Cup for well over a decade. The high-quality sisal is dense and vibrant. The unique thing about this board is the wire spider. Instead of staples, the ultra-thin wire is embedded into the bristles. This provides 10% more playing area and virtually nothing to get in the way of the darts. It also strengthens the overall board’s structure, making it sturdy on any wall. This regulation-sized dartboard is a great choice for any enthusiasts. It is endorsed by the American Dart Organization for its superb quality. It has East African sisal fibers that are tightly woven to provide great healing. The dividers on this board are incredibly thin and rounded to direct darts into the board. The staples are thin and rounded as well. The center bullseye is staple-free for clear aiming. It also has a removable number ring and easy mounting hardware to get the board up for playing in no time. This dartboard is made to withstand a lot of wear and tear. With an official tournament size of 18 inches in diameter and a weight of 13 pounds, the board can handle anything you throw at it. It is made of densely woven sisal fibers for longevity. The wires are rounded to reduce bounce out. While there are staples to hold the wire spider down, they are strategically placed and also rounded so that they don’t get in the way. The bullseye is staple-free, allowing you to make your shot with no obstacles. 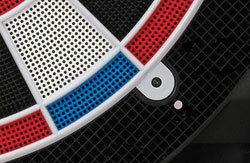 Reminiscent of a classy bar dartboard, the DMI bristle dartboard is a beautiful addition to any game room. The cabinet is made from an attractive oak. The board has high-quality sisal fibers that are resilient and smooth, even after repeated throws. The spider grid is held onto the board with minimal staples. Unlike other boards that have staples throughout, this board only has a handful that are carefully spread around the board. The oak doors house a dart holder and chalkboard score charts. As a higher end option, this bristle dartboard doesn’t skimp on the details. Everything is made from high-quality materials to create a truly handsome and effective board. The cabinet is made from a mahogany stained pine. The cabinet doors are attached with self-closing brushed nickel hinges, providing a unique appearance. Made from dense sisal, the board is built to last. The board and the scoring ring are removable, allowing you to rotate it for even wear and tear. On one door, a scoring chart is tacked on for easy reference. On the other, a dry erase score chart is present for easy tracking. 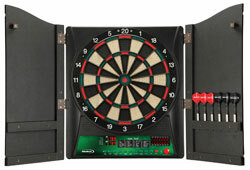 Made for the modern man, these dartboards pack a lot of unique features. They come in a variety of styles and sizes. These boards are a great option for seasoned players and amateurs alike. Unlike bristle boards that are made from sisal, electronic boards are predominantly plastic. They are covered in tiny holes. Darts will stick in this hole and send a message to the internal computer to calculate your score. Generally, electronic boards come with plastic tipped darts. They are much safer, yet a lot lighter. Some models come with steel tips to make playing feel a bit more genuine. 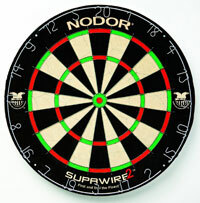 The Arachnid Cricket Pro 650 dartboard is a great party device, as up to 8 people can play at one time. The board itself it made from NylonTough. It is incredibly durable, maintaining its shape through years of playing. The segment dividers are also very thin and designed to prevent bounce outs. The board is regulation size and features 24 different built-in games with 132 variations. Not only does the board keep players’ score, but it also has a number of other great features, such as prompts and a handicap mode that allows players of different skill levels to compete. This regulation size electronic board is the ultimate party board. It has 32 built-in games with 171 variations. The LCD screen is large and bright. It keeps the score of up to 16 players while also prompting them of their turn to keep the action moving. The board is made of commercial-grade nylon and the segment dividers are thin and rounded. The segments themselves are curved inward towards the divider to further guide the darts into the board. 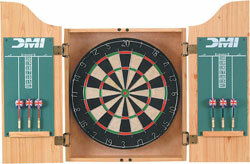 To make things even better, the board features slots to hold the included 6 darts so that you never lose them. This electronic board is made from a unique material. Instead of plastic segments with tiny holes, the board is made from a unique E-bristle. This material provides an authentic bristle dartboard playing experience with all of the modern perks of an electronic board. . The board comes in a beautiful wooden cabinet. The board itself is mounted inside the cabinet, allowing you to hide it from view when it is not in use. While it does include 34 games with 183 variations, the board excels with Cricket. In fact, one of the cabinet doors features a designated Cricket X/O display. Also built into a gorgeous cabinet, the Regent-Halex Millennia 1.0 electronic dartboard packs in a lot of features for thrilling play. It has 28 games with 167 variations and two scoring displays, one of which has X/O scoring for Cricket. The board itself it made of durable plastic with dividers designed to prevent bounce out. The cabinet features dart holders to keep everything in place. The board even has a “Trash Talk” feature to make any heckler put his money where his mouth is. 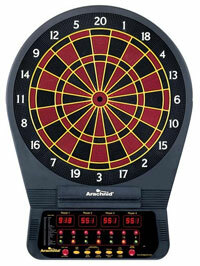 Overall, there are a plethora of great options when it comes to dartboards. Guys should think about how they play and what they need to pick the right one. Electronic – For some guys, a simple electronic board is all that’s needed. These boards have everything you need to spend a few hours competing with friends. The built-in games and score tracking systems make it incredibly easy to pick up and start playing. 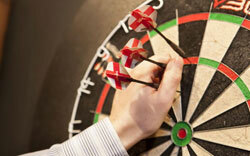 Bristle – For more serious players, a bristle dartboard may be the way to go. These boards have only gotten better with time. They are made from high-quality materials to last a lifetime and offer guys the opportunity to play with authentic darts. Of course, there’s always the option of boards in cabinets. These boards can add a level of sophistication and class to any space. Not only that, but they keep the entire experienced contained in one spot. Guys can easily close the cabinet to keep everything in one place. It’ll still look great on the wall thanks to the wooden finish. Either way, having your very own dartboard is the way to go. Gone are the days of playing at a bar. 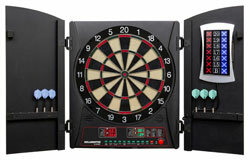 Instead, guys can create their very own game room with a dartboard. It’ll provide countless nights of heated competition and fun with friends.